Tableware is made up of the plates, napkins, cups and utensils used for serving and eating meals at a table. 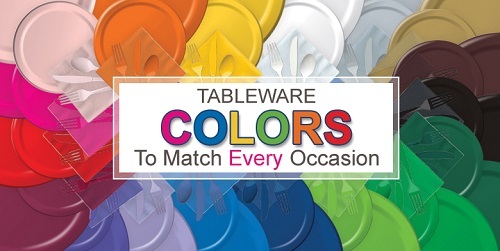 Browse our 19 different solid color tableware settings to help you coordinate the colors at your next party or event. Whether you are searching for pink tableware to compliment your litttle girl's birthday party, or maybe a breast cancer awareness event, we have many different colors and styles to choose. We offer a selection of our Designer Tableware that comes in different patterns as well as solid colors located below. Also, browse our large assortment of different themes, popular character and super hero tableware available in our Boy's Birthday and Girl's Birthday categories.